Darien’s Hudson Pokorny shoots and scores during the Blue Wave’s 7-6 victory over Manhassett (N.Y.) on Saturday in Darien. DARIEN — It was as much a boxing match as a boys lacrosse game. Manhassett (N.Y.) made the long bus ride from Long Island Satuday to prove its mettle against Darien, the No. 6 ranked squad in the nation. Every faceoff and every loose ground ball over the 48 minutes was not a place for the faint of heart. Both the Blue Wave and the Indians came away with a measure of what they wanted as Darien dug down deep to earn a 7-6 triumph. Manhassett’s Louis Perfetto forged a 6-6 tie with 59.6 seconds left in regulation. It took Darien just seven seconds to answer and keep its 59-game winning streak as well as its current 5-0 undefeated season alive. Brian Minicus scored his third goal of the game off a feed from Tanner Strub at 52.7 to make it 7-6. Manhassett knew it could not run and gun with the prolific Darien attack. So the Indians chose to take their time on each possession to try to shorten the game. Manhassett’s Marc Psyllos was successful on faceoffs in the first half allowing the Indians to control ball possession while building a 4-3 halftime lead. Manhassett’s possession time put the Darien defense into the spotlight. The work of defenders Andrew Darby, Matthew Gould and Charlie Olsen as well as midfielder defenders Blake Sommi and Jack Joyce up top of Manhassett’s 6-on-6 attack allowed the Darien offense to answer in the second half. Tanner Strub’s faceoff work in the second half created the opportunities for the Blue Wave to rally. 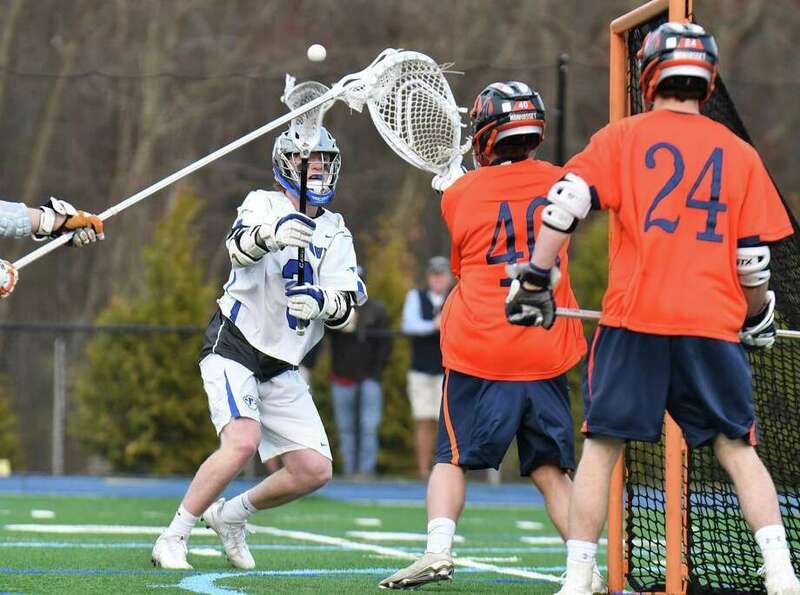 Darien goalie Sean Collins was active and solid while collecting 12 saves. He made eight in the first half and a huge stop in the closing seconds to preserve the triumph. While the Indians were not pleased with the final score, the benefits of Saturday’s clash will show during their league season back on Long Island. Senior goalie Grant Petracca finished with nine saves. Records: Manhassett (N.Y.) 2-4, Darien 5-0. Scoring: M—Devin Kennedy 1 goal, Mike Farrell 1g, Chris Alcaraz 1g, Marc Psyllos 1g, Louis Perfetto 2g. D—Brian Minicus 3 goals, 1 assist, Logan McGovern 1g, 2 assists, Tanner Strub 1a, Ryan Darby 1g, Henri Pfeifle 1g, 1a, Hunter Pokorny 1g. Goalies: M—Grant Petracca (9 saves); D—Sean Collins (12 saves).